Free games: Grab one of 20,000 Steam keys for Next Up Hero, a new community-driven RPG! Rarely can dying be considered a good thing in games but in Next Up Hero it most certainly is. 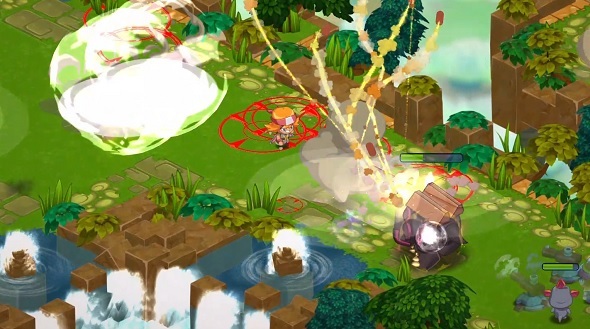 It’s a new 2D action-RPG driven by a special feature called Community Continue. Simply put, when you die in the game’s world, you leave behind an Echo that can be raised by another player to help them through whatever challenge they may face. Community Continue is a feature inspired by the old days of playing hard arcade games, when friends took turns to try to beat a single game. What Next Up Hero allows is for an entire online community to work together, getting stronger on the back of each other’s deaths. It’s the kind of feature that you should expect from developers Digital Continue, given that they were founded by Joe Tringali, who is also the co-founder of 5th Cell, the creators of innovative games including Scribblenauts, Lock’s Quest, and Drawn to Life. Other than Community Continue, Next Up Hero boasts everything you’d expect from an action-RPG – nine heroes to choose from, lots of weapons (includingrocket launchers, swords, laser turrets, bongo drums, and boomerangs) and abilities to make them your own, and Champion Trials to unlock that will really test your skills. Currently, Next Up Hero is on Steam Early Access in a limited beta period that runs until January 10th, 2018. We are giving you a chance to get involved by giving away 20,000 keys. You can grab one for yourself by completing one of the actions in the widgets below – there are key redemption instructions underneath the widgets. As well as getting to play the game now, the key will net you a few other perks: your beta progress will be saved for the full Early Access launch and you’ll receive a loyalty discount, too. If you miss out on a key then you can also sign up for one at beta.nextuphero.com.